AV technician – AV simply stands for audio-visual. Most events will have a professional which deals with on-site lighting, sound and any other staging needs. Booth – this is the American word for an exhibition stand or allocated space. Conference pack/kit – A collection of documents and event materials handed out at registration. Usually contained in an envelope or folder. Can also be called a media kit or delegate/exhibitor information pack/exhibitor manual. 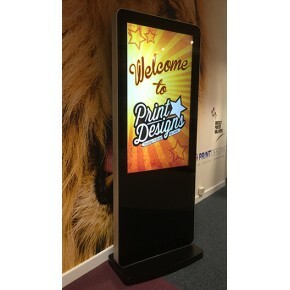 Digital Display Stand – An exhibition stand which supports LCD screens for an interactive experience. Exhibition Plan – this is usually an image showing how the exhibition will be laid out, including spaces and booths to hire, walkways, facilities etc. Early Bird Registration – many events will have an early bird registration, where exhibitors can book a booth at a reduced price. Get in – the time allocated for staff and exhibitors to enter the venue and set up their booths. Get out – the time allocated after the event for staff and exhibitors to dismantle their stands and leave the venue. Lead time – the time between when event arrangements are made and when the event takes place. Literature Holders – A portable structure which is used to display marketing material such as brochures, poster, flyers and catalogues. Rental Booth – some events will provide booths which can be rented out, so exhibitors don’t have to invest in their own portable stands and set it up. Risk Assessment/Management – if you are attending as an exhibitor, the event organiser should have compiled a risk assessment, however exhibitors can also carry out their own, which is a good idea if you are bringing employees. Assess the risk of injury or loss by attending the event. Shell Schemes – a commonly used way to divide exhibition booth space. Traffic/traffic flow – the movement of people through an exhibition. Hopefully this glossary answers your first questions – get in touch if you need any further help!